CSA coming up! Please Read! Posted 5/21/2012 11:15am by Gregg Keckler. Two weeks until the CSA begins! When you get to the stand there will be a clipboard with your name on it, check off your name and pick up a cooler or box and go. Half and full shares will be clearly marked. If you order extras it will be listed behind your name. Go to the stand and pick up your extras. We will have all the extras listed in the store on our website. You can order items there. I will be opening the store next Monday, May 28. As the season progresses we will have a section for bulf items. These will be larger quanities at a discounted price. We have our own pasture-raised beef and pork. The eggs are from our chickens .Our chickens are all outside -free-range and supplemented with cracked corn and our own organic veggies. We have our own butter churned by me (and my KitchenAid). Our cow is pastured with supplements of some corn and alfalfa hay. We also have our own jams and jellies which Gregg created from our fruits. We freeze the fruit throughout the summer and then make the jam during the winter months. The pies and breads are made by our daughter-in-law, Tamara. The pies are fresh. Our fruits are cooked into a filling because they keep better that way. The breads are made fresh for you. If you order any baked goods, please order at least 4 days before your delivery or for the next week. We will again be offering Ed Breckbill's Whispering Brook Farm Cheese. His cheese is from his own milk, his own herbs and processed right on his own farm. No bulk tank of milk from any other farm, just his own. Try it out, you will be amazed at the difference in taste from the ones in the store. Paying for Extras: you can choose to pay with paypal at the checkout and pay with credit card OR you can choose invoice at the checkout . If you choose invoice you can pay at the stand or send a check in the mail. If you choose invoice you can take a 5% discount. The discount will not show up on the checkout screen, but you can calculate it yourself and then when we get your check or cash we will manually adjust the balance. I hope this makes sense. You do not need to send a check each week. At the end of each month we will send you a reminder of your balance and ask you for payment then. If you have not paid your balance yet for the CSA, pleaswe do this as soon as possible, expecially for the spring session. You will be getting a reminder of your balance today. PLEASE DO NOT PAY WITH PAYPAL IF YOU CHECKED OUT WITH INVOICE! Send us a check instead. We are looking forward to a great year. All the vegetables look great because of the mild spring weather. All the fruits are about 3 weeks ahead of schedule. So we are picking strawberries now. We should be in mid-season for strawberries when the CSA starts. I will send an email every Monday throughout the season to let you know what is coming that week. We hope you get outside and enjoy the great weather, even if it is raining. Being outdoors is good for the soul! Farm Stand opens on May 5 - Saturday! Posted 5/3/2012 2:19pm by Gregg Keckler. lettuce, salad greens, asparagus, and spearmint tea. Arugala, stored potatoes and carrots. Great Rhubarb, Breaburn apples, Pink Lady apples, Gold Rush apples, and sweet Fuji apples. We are looking forward to seeing folks on Saturday, May 5. Stop in, look around and take home some fresh greens, vegetables, and other good stuff! Posted 5/2/2012 9:36am by Gregg Keckler. May is here! We have little plums and apricots on the trees. The rhubarb looks great and the strawberries are just around the corner. This is a very dry spring (the first dry spring for several years). So the strawberries should be very sweet. All the fruit trees are about three weeks earlier than usual. We planted new raspberries and a couple hundred plum, cherry, apricot, and peach trees this spring. We are expecting a great season this year. Each year is unique because we are guided by the weather. The cherries look a little spotty, but the plums are loaded. We have over 3000 tomato plants growing in the greenhouse. We are pulling spring onions and radishes, picking asparagus, cutting lettuce and some spinach and rhubarb! The cycle has begun afresh! We sent two hogs to the butcher. Our chicks and turkey poults will be here by the end of May. We are weeding peas today and transplanting kale, cabbage, broccoli, Swiss Chard, and other things. The markets are starting this month. We are looking forward to our markets and farm stands. Come out and visit us and check out the spring produce and Gregg's assortment of unusual jams and jellies. The deadline is May 15 to sign up for the spring session which begins the week of June 4. Cost full share - $300.00 and half share - $160.00. You can sign up on the website www.orchardcountryproduce.com go to the sign up page. You can pay with paypal or you can click invoice at the checkout and send us a check. Have a Great day. Get outside and get some natural vitamin D. Try to shut out the noise and listen to nature. It will refresh your soul! Posted 4/13/2012 9:05am by Gregg Keckler. This is reminder that the deadline to sign up for the CSa for 2012 is April 30. It is coming soon so please sign up now if you want to join the CSA for this season. The first week of the spring session begins on June 4. We will send out emails throughout May letting you know about the delivery particulars and the extras that we will be offering this year. I will be sending individual emails to those who are on our list to get drop offs letting you know how many folks have sign up for your location. 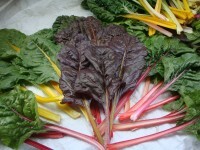 We will be at NGS for a mini market and CSA display on April 24. Come and visit if you are in the area. We will also be going the Suburban Hospital in Bethesda on April 24 for a CSA display and sign up event. If you want to sign up for the CSa you can go to our website www.orchardcountryproduce.com and sign up online. You can choose to pay with paypal or you can click invoice at the checkout and just send us a check. We are looking forward to theis season. With the early spring and mild winter, fruit is running about three weeks earlier than usual. The plums and apricots have already set their fruit. So we are hoping for no really hard frosts now. We planted 600 new raspberry plants yesterday and today the kale, and lettuce are going out of the greenhouse into the field. We have been planting lots of small red potatoes for the early ones and the big Evas for the large white ones. We have 4000 onions coming next week and we will be planting them on Friday April 20, if anyone is available to help let us know. We hope that you are as excited about this year as we are and we are looking forward to seeing everyone again at the markets. Remember DOT Farmer's Market starts May 1 from 10-2! That is only 2 1/2 weeks from now! Posted 3/19/2012 8:34am by Gregg Keckler. Posted 3/5/2012 2:28pm by Gregg Keckler. March is here and we are planting up a storm- lots of bedding plants and some tomatoes and flowers. We also transplanted kale into plugs. Cabbage seeda are in the ground. We have planted arugala and lettuce for the first markets and for the April deliveries. We planted spring onions and peas outside already. All the raspberries are pruned. The fruit trees are all pruned as well. We are looking at March 24 for a tree planting day. If anyone is interested in coming please RSVP by March 17. You can come as a group or individually and bring the family for a great day on the farm! We will give you a tour of things and host a great dinner and you can get some fresh air! We have 2 pigs that should be ready to butcher by the middle of April and 2 more that are about 100 lbs. We ordered our chicks and turkey poults for delivery in mid-May. ATTENTION! Folks in the Alexandria area - We will be having a farm stand on Saturday mornings at St. Luke's Episcipal Church at 8009 Fort Hunt Rd. - Just off the George Washington Parkway. We will have our farm stand open on May 5 and we will have a CSA pick up there as well beginning the first week of June. If you have already signed up and would like to change to this location, just send us an email and we will make note of it. We have added this location to the drop off spots on the CSA sign up page on the website. I hope this will facilitate more folks in the Northern Virginia area. Remember if you would like a CSA drop off in your coummunity or business get 6 shares (any size) and we will do a drop off for you. Email us with any questions. There are 55 days left to sign up for the early bird special of $450/half share and $870/full share. April 30 is also the last day to sign up for the spring session which begins in June. Just to let folks know you can go to the website and sign up for the CSA; you can pay with paypal or if you would prefer you can send us a check by clicking on invoice at the checkout. Thanks to those who signed up and paid up early. We were able to purchase a planter for seeds of any size - the very smallest lettuce seeds to the larger corn and bean seeds. This will be a great help because placing and covering the seeds will be more accurate and relaible. Less chance of crop failure. FYI: Most of you know about our family, but for those of you who are new to us. We have 7 children. Stuart- married to Tamara with granddaughter, Tabitha and another on the way. Tamara does all the baking. Katie - married to Ryan Tuckey. They just purchased a 70 acre farm near us and are beginning their own fruit and vegetable farm. We are using 15 acres of their land this year. Martha- married to Daniel Caudill. Martha has her own landscaping business. Those who go to Cedar Lane know Martha. Sarah - works for a consulting firm in Old Town, Alexandria, VA. She would love to go into beef farming some day. Sarah helps in Columbia and also goes with Katie to Kentlands and helps at Westminster. Lydia - married to Mark Wooten. She is a nurse at Gettysburg Hospital. Lydia has helped out at the Westminster Market. Viriginia - in college. She always goes to Westminster and Columbia in the summer. Oliver - a junior in high school. Everyone knows Oliver! He has been to DOT, Columbia, and Cedar Lane. Our children have all been involved more or less in the farming for many years. They have been a great help getting things done . We are waiting anxiously for the first asparagus and the beginning of spring vegetables. Have a great month. Spring is practically here! Posted 2/13/2012 9:11am by Gregg Keckler. Tonight at midnight the store will close for February 16 delivery. There are still a few stops that are shy of the $50 min. Please encourage folks who are interested in placing an order to do so today for the following stops. The following stops do not have ANY orders. Please try to get the $50 min for these places. For those of you who were picking up at River Park, but did not live there. Gregg had a suggestion - you could go to Gangplank Marina to pick up. It is not too far away from River Park and Gregg said that all you need to do is knock on the guard shack to get your orders. Just a thought! Thanks to all who have supported us by placing orders so far. I will be in touch when the store closes to remind everyone about the Thursday delivery. The weather looks good and we are encouraged! Posted 2/3/2012 10:24am by Gregg Keckler. Our vegetable department has shrunk drastically. This is the hard times for local vegetables. We still have butternut squash, but they do have some spots on the outside. We have cabbage. These are still in the field. We pick them as we need them. We are peeling the outside leaves. So they are a light green color. We have white sweet potatoes. They are a little wrinkly, but still very good eating. We still have plenty of apples. Eat lots of apples! The earlier varieties - Stayman, Yellow Delicious, and Ida Red are softer varieties. The tart apples are - Stayman, York, Pink Lady, Granny Smith, Gold Rush, Suncrisp, Braeburn. We are offering Asian pears. Dave Peters, a neighbor of ours had quite a few of his Asian pears in cold storage. They taste great and look way better then our sooty blotched Bosc pears. When you get this email yuo may place your orders. The store closes at 12 midnight February 13. The delivery will be on Thursday, February 16. You can pay using paypal or you can use invoice and send us a check for the total. There are still a few folks who have not sent checks for the January delivery. Please send those ASAP. ATTENTION: You may not use River Park as a drop off if you do not live there. River Park is for residents ONLY. Thanks to all who have been supporting our winter delivery this year. We look forward to bringing you local fruits, veggies, baked goods, and jams this month. Posted 2/1/2012 9:52am by Gregg Keckler. Thanks to all who have joined our CSA for 2012 so far. We look forward to providing fresh fruits and vegetables for you again this year. Gregg has been buying seeds. He and Oliver are arguing over which heirloom tomatoes to grow this year - Black Tula, Mortgage Lifter, or Boxcar Willie. Gregg and James have been pruning apple trees. This month they will do peaches, cherries, and plums. Martha is pruning yellow, pink and black raspberries. We are going to replace most of our red raspberries this year. For your information: We own property in three different locations. -We also have an agreement with a dear friend and neighbor to care for 5 acres of apple trees with no rent- just our promise it care for the land. So with that said every year after we butcher the large steers, we bring the smaller ones back to the home place for the winter. It is easier for us to care for them in the snow and we can keep all our hay in one place. In January we replaced some livestock fencing that was 15 years old. One steer kept getting out and visiting all the neighbors along our road. Thankfully he was very friendly, just a little to free with other's property. So now he is back in the pasture and we are no longer searching throughout the neighborhood for him. The weather has been usually mild so far. Gregg is hoping if the weather holds to plant peas by March 1. Oliver, on the other hand, thinks we will probably have a blizzard by March and change all those plans. It is nice, in a sense, to be dependant on the weather. It gives us change and variety of occupation and food. If we have a dry spring, the strawberries will be smaller, but very sweet. If there is a wet spring the strawberries are larger, juicier, but not so flavorful. Either way we know why things taste as they do. The predictableness (My dictionary says that this is not a word, but it is the word that I want to use, so I hope that you understand it.) of the outcomes gives each of us a sense of control. To us this is more preferable than buying strawberries in the store and not understanding why they look or taste as they do. CSA- if you are planning to sign up as a business or neighborhood drop off for either a Wednesday or Friday delivery in 2012, please let us know. Some already have contacted us. If you know that you WILL NOT be joining us as a group drop off, please let us know ASAP so that we can fill in your slot with other locations. We will save space for our regular drop offs first and then add new ones if there is space available. Remember if your location has 6 shares (any size) we will arrange a drop off. Farm Friends and Market Customers- We are looking forward to being back at each of our market locations again this year - same time- same place. We are hoping to offer more bulk sales of certain items that we grow in abundance and we also plan to plant more of the rare and unusual vegetables. Winter Delivery Customers - We thank you so much for your support during he winter months. you have helped us by eating our apples and winter vegetables instead of buying store bought ones. We appreciate your kindness. It is truly kindness to pay for and eat less than perfect fruit and vegetables as well as support a local farm. Future plans- order chicks and turkeys, buy piglets. We will be having at least one tree planting day in March or April depending on the weather. Bring the family - visit the farm - plant a tree - have lunch with us - and breathe the good air! Let us know if you have a group that would like to do some planting on a weekday. We will try to arrange something. Have a great month! Posted 1/17/2012 4:28pm by Gregg Keckler. If you are getting this email then we have gotten an order from you for our January Winter Delivery of fruits and vegetables. Our Delivery day will be on Thursday, January 19. This is our tentative schedule for the day. Gregg will be going to the DC area and Oliver will be in Columbia, Reisterstown, and Westminster. Please remember that this is January. We are doing our best to keep our fruits and vegetables looking good. That does not always mean that they are perfect. Our stored things can not compete with the grocery store. Their vegetables and fruits are NOT local. This time of year if you want to purchase local things they are stored or maybe greenhouse grown like the lettuce and arugala, but certainly not field grown. So if you feel that the skins of your pears do not look good enough to eat, just peel them. If they get soft quicker than you were expecting, make a smoothie! I made a smoothie today with lime juice, pears and some kiwis. It was delicious and reminded my that even old pears have a good use. Be creative! Think of this as an adventure. How to eat LOCAL in January! Thanks for your support. It humbles us to see how you have put your trust in us.